The seventh CreativeMornings event in Chicago was charged with the meme of marriage. 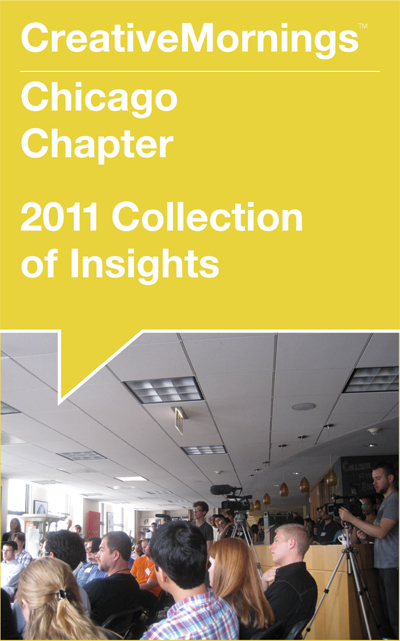 Organizer Mig Reyes kicked off the first Chicago CreativeMornings of 2012 with names that were destined to be paired, such as Bryony Gomez-Palacio and Armin Vit of UnderConsideration, Ellen Lupton and Abbott Miller. Knoed Creative’s first piece of advice was to decouple spaces in order to keep the couple sane and sweet. They emphasized the importance of finding a comfortable ratio between number of projects and number of clients. A bloated client list can spread efforts too thin; a lean list means being picky—on purpose—and keeping the designer-and-client relationship consistently healthy. This echoes Author Seth Godin’s belief: “The enemy of creativity is fear...In the long run, the enemy of fear is creativity. I’m sure of it.” Knoed Creative’s closing advice was fitting to a presentation rooted in demonstration. The subtext of “No fear” is just as pithy and provocative: Do it! Furthermore, to complement their studio work, Knoed Creative strongly encouraged keeping side projects. 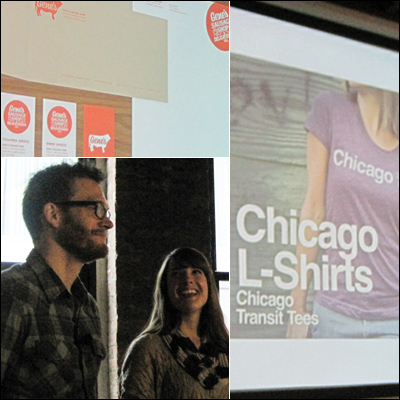 Their own include Chicago-L Shirts, inspired by Chicago’s transit train system “The L.” Kim Knoll makes handmade vintage-inspired jewelry at RFRM™ (pronounced Reform). Big thanks to: Chicago Portfolio School, for hosting, and 24 Seven for sponsoring Chicago CreativeMornings #7; to organizer Mig Reyes, videographer Craig Shimala, photographer Chris Gallevo for their great work on making CreativeMornings happen in Chicago. Typeface of quotes is called Massive designed by Shawn Hazen, who also makes awesome typographic illustrations for series Creative Roles. My coverage: view more photos of CreativeMornings in Chicago; read more write-ups about Chicago CreativeMornings.